An amazing villa set in the village of Cravoeiro, Algarve, a 40 minute drive from Faro airport. This property is a stunning, well equipped, air conditioned 4 bedroom villa. It hosts a 12 x 6 m swimming pool surrounded by terraced areas and outdoor seating spaces all set within private gardens. This tasteful and spacious accommodation comprises of open plan lounge/family area with a full sized pool table, free TV, central fireplace with French doors leading out to the sun terraces and swimming pool area. The villa comprises of 4 bedrooms, two double bedrooms with ensuite bath and shower with french doors to outside terraces and swimming pool. The remaining two bedrooms offer twin and triple bed accommodation. There is an additional family bathroom with bath and shower and a toilet situated off the main lounge. From the lounge area you enter the well equipped kitchen space with a dining table for 6 people. The property is set in a good sized plot, fully fenced and gated, within mature gardens. The property also offers a sand play area for the children, gazebo seating area, outside shower and an outside dining table which can seat 9 people comfortably to relax and enjoy something to eat and drink. There are numerous sun loungers available on the terraces for guests to sunbathe situated around the villa. The villa is well popular with families with children, it also appeals to all ages due to its close proximity to Carvoeiro nightlife. 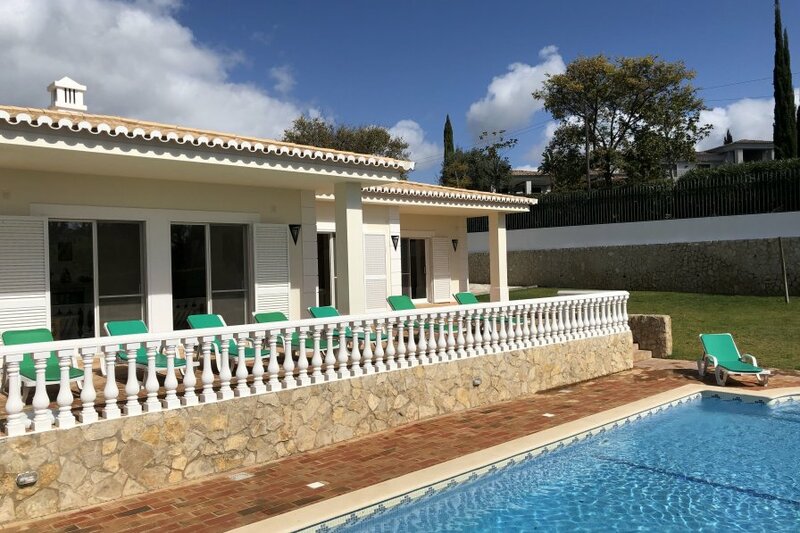 The villa is a popular locale for golfers too due to its adjacencies to the several golf courses dotted in and around Carvoeiro.